Swing dancers perfect their craft with the UBC Swing Kids. Though there are Latin ballroom dances, UBC’s Latin Dance club puts more emphasis on the social Latin dances like salsa, merengue, bachata and the Argentine tango. As club president Diana Perez explained, this means there’s less focus on choreography. The Latin Dance Clubs teaches salsa, merengue, bachata and the Argentine tango. According to Perez, the club reported its highest registration three years ago when over 200 people would attend their club parties. Those numbers have been diminishing little by little over the past two years, but so far this year is going well in large part due to a big push on social media and working more cohesively as a club. “We want to make this much more of a community than it was before,” Perez said. Some other changes being put in place this year are the addition of more social events organized through the club to encourage members to socialize as a group outside of classes. 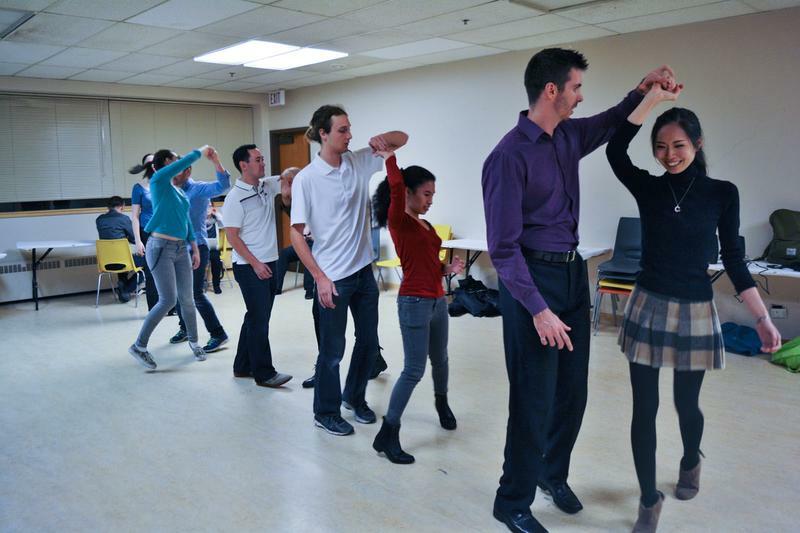 Perez said the socials offer those members who feel shy about trying social dancing outside of class a chance to smoothly transition into the Vancouver latin dance community as a group. If Latin dance isn’t quite your style, UBC also offers the chance to test out an American dancing tradition — swing dancing. UBC Swing Kids lets students try out the Lindy hop, West Coast Swing and Blues— popular dance styles from the 1920s to 50s. These dances, Lindy Hop Coordinator Sanjana Akella said, were inspired by swing, jazz and blues music of the time. When explaining the difference in dance styles, Akella said the Lindy Hop is one of the older forms of swing dancing inspired by communities in New Orleans. As their club website states, Lindy Hop is traditionally danced to classic jazz and big band music, and is characterized by an active, energetic feel. As the club’s website states, West Coast Swing focuses more on a smooth dance style with an elastic feel. This semester, Swing Kids is still adjusting from some changes and financial difficulties at the club from last year. They're also have an almost completely new executive team for this school year, but they're having a great start to their classes so far. In particular, they’ve had a lot of interest in their beginner Lindy Hop class. They are also hoping that next semester they can start hosting monthly social dances for their club. Akella said one of her fondest memories was the chance to host an introductory lesson to West Coast Swing with JumpStart for over 200 people. “It was a lot of fun just watching people grasp this dance, the questions they’d ask about it ... they were just so pumped. Putting the seed of dance in their mind, it’s just so exciting,” Akella said. For the rest of the fall semester, experienced swing dancers interested in getting involved are welcome to drop into classes and speak to instructors about joining in. For newcomers to swing, Akella and Gmoser said they recommend coming to the first classes in January for the start of the winter semester classes to make sure you get the full Swing experience!